The BioNet® Bioreactor is the latest in autoclavable benchtop glass vessels. Available in a range of sizes: 3, 5, 7, 15 and 20 liters total volume. All metal components are manufactured from 316L stainless steel with electropolish. The 3L fermenter provides a minimum working volume of under 0.5L and comes with a typical microbial fermentation configuration that can be customised with components in the Accessory section. Integral scaling, improved component designs and extensive product inventory makes this the most user-friendly fermenter available. Air inlet pipe used to meet the oxygen demand of a culture. Allows a sterile gas stream to be sparged into the vessel. This is a “drilled hole” or “flute” sparger, which can be used when high gas flow rates are required, as it has a minimal pressure drop. The holes in this pipe are located in the bottom of the tube, to ensure that the media is driven out by the gas stream. Includes 10 mm Hex Nut, Washer and 8.5 x 2.5 mm Silicone O-ring. Compatible with 3 & 5 liter Vessels, 10mm port. 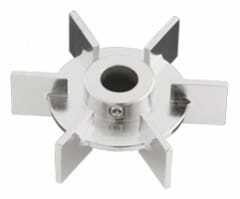 The following impeller is available for the agitator assemblies, both lipseal and magnetically coupled types. Fits onto the standard 8 mm diameter shaft, includes size M3 x 5 mm hex set-screw. Compatible with 2 & 3 liter Vessels, 8mm shaft. Baffles are used to increase the mixing efficiency. Without baffles, the medium flow can become laminar, causing poor mixing efficiency and mass transfer. The baffles are mounted near the reactor wall for optimum mixing performance. The baffle assembly consists of three baffles and mounting hardware. Mounting hardware includes 3 ea. 6 mm Hex Nut, Washer and Size AS-107 Silicone O-rings. Compatible wirh 2 & 3 liter Vessels, 6mm port. 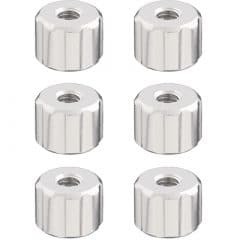 The following blind stoppers are available for the (M18 x 1.5 mm or G-3/4) threaded headplate ports and include Silicone O-ring. Compatible with 2 – 7 liter vessel, G3/4 port. Compatible with 2 – 7 liter vessel, M18 x 1.5 port. These blind stoppers are designed to plug unused ports into the headplate. The assemblies are fitted into the headplate from the inside of the reactor, leaving only a flat surface inside the reactor. Includes Hex Nut, Washer and Silicone O-ring. Compatible with 2 – 20 liter vessel, 10mm port. Compatible with 2 and 3 liter vessel, 6 mm port. These are the fluted nuts used to attach the vessel headplate to the vessel base. Sold in packs of six each, sized for the 2 – 20 liter vessels. Compatible with 2 – 20 liter Vessel base. This height adjustable sample pipe assembly consists of an assembly holder for 6 mm tubes, and a 6 mm OD x 4 mm ID sample tube. With this device, the culture fluid can be sampled at any desired level. Includes 10 mm Hex Nut Washer and 8.5 x 2.5 mm Silicone O-ring. Compatible with 2 – 5 liter vessel, 10 mm port. The air overlay pipe can be used for either gas outlet or gas overlay. The latter use is for headspace aeration (separate from or in combination with sparging gas through the culture). Includes 10 mm Hex Nut, Washer and 8.5 x 2.5 mm Silicone O-ring. Compatible with 2-20 liter Vessels, 10 mm port. The thermowell allows you to insert a temperature probe in the reactor. Fill the thermometer pocket with water or silicone oil in order to improve thermal contact between the culture and the probe. Includes 10 mm Hex Nut, Washer and 8.5 x 2.5 mm Silicone O-ring. The septum holder is equipped with a silicone rubber septum and can be used as a universal addition port by piercing it with one or more needles. Includes 20 x 2.0 mm Silicone O-ring. Compatible with 2 – 7 liter vessels, 18 mm port. The media inlet triple port allows you to equip one M18 x 1.5 mm threaded port with three addition ports (e.g. for acid, alkali and anti-foam addition). This device can be used to expand the number of entries beyond the number of ports in the headplate. Includes 20 x 2.0 mm Silicone O-ring. Compatible with 2-7 liter Vessels, M18 x 1.5 port. This housing fits into a G-3/4” threaded port and can accommodate a pH or ORP electrode, a Dissolved Oxygen sensor, a Cell Density probe, or other 12 mm OD tubes. All items that are held by this housing are at a fixed depth. 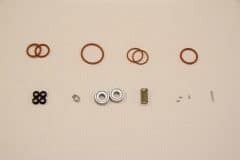 Includes AS-111 internal and AS-023 external Silicone O-rings. Compatible with 2 – 7 liter vessel, G3/4” port. This housing fits into an M18 x 1.5 mm threaded port and can accommodate a pH or ORP electrode, a Dissolved Oxygen sensor, a Cell Density probe, or other 12 mm OD tubes. All items that are held by this housing are at a fixed depth. 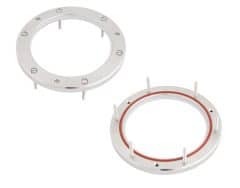 Includes AS-111 internal and 20 x 2.0 mm external Silicone O-rings. Installs into the central M30 x 1.0 mm port of the 2 through 5 liter vessels. Includes 32 x 2.5 mm Silicone O-ring. 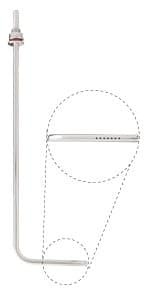 316L stainless steel stand for 3 liter vessels. Includes adjustable braces to stabilize the lower portion of the vessel, and protective silicone rubber feet for the three legs. This prevents wobble and stray signals which may be transferred through the legs when placed in multiples on steel clad benchtops. Compatible with 3 liter Vessel & Accessories. Dished bottom bioreactor vessel, suitable for both fermentation and cell culture runs. Dished bottom ensures optimum mixing. 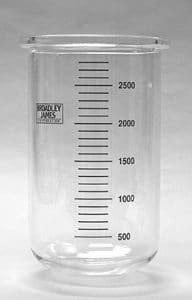 Marked with approximate volume graduations, made from borosilicate glass, fully autoclavable. Compatible with 3 liter vessel stand and single piece retainer ring. Connects to the 3 liter vessel, forming a seal between the vessel and the stand. Single piece, 316L stainless steel. 316L stainless steel electropolished headplate for 3 liter vessels. 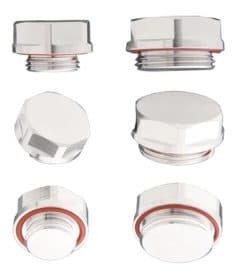 Threaded ports for a wide variety of accessory fittings. O-rings, fittings, etc. purchased separately. 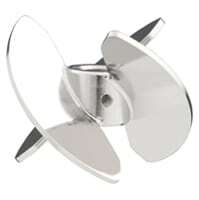 The following impellers are available for the agitator assemblies, both lipseal and magnetically coupled types. Fits onto the standard 8 mm diameter shaft, include M3 x 5 mm hex set-screw. The Vortex pumps the liquid “down”, creating a vortex in the liquid. The Scoping impeller is the opposite, and pumps the liquid “up”. Kit to self-rebuild the Lipseal Agitator Assembly. Compatible with 2-20 liter Small Agitator Assembly. a 6 mm OD x 0.78 mm ID sample tube. This sample pipe has a very small dead volume. 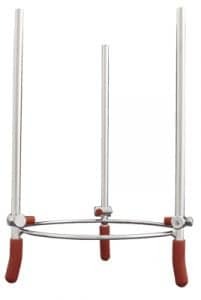 The height adjustable sample pipe can be used with or without a sample screen. If it is used without a sample screen, the small dead volume of the pipe guarantees samples from the culture that are representative for the reactor. If a sample screen is used at the end of this pipe, cell-free samples can be drawn from the culture. Sample screens are available in several pore sizes. 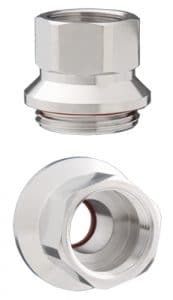 Installs into the central M30 x 1.0 mm threaded port of the 2 through 5 liter vessels. Includes 32 x 2.5 mm Silicone O-ring. 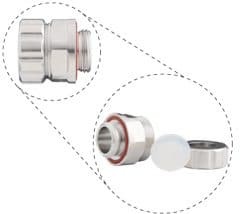 This device fits into the standard M18 x 1.5 threaded port and allows for cooling water to be circulated through it, chilling the contents of the vessel. 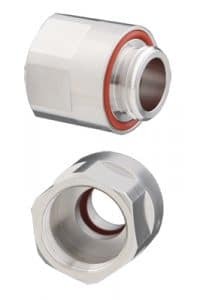 Standard 6 mm tube fittings for attaching the cold-water tubing can be hooked up to either a standard bench water supply or to a recirculating chiller pump. Includes 20 x 2 mm Silicone O-ring. Compatible with 2 – 5 liter vessel, 18 mm port. Compatible with 2 – 3 liter vessel, 8 mm shaft. Vessel operation at elevated temperature combined with aeration of the culture might cause too much evaporation during a run (increasing the nutrient concentration and decreasing volume); this can be prevented by using an air-outlet condenser. 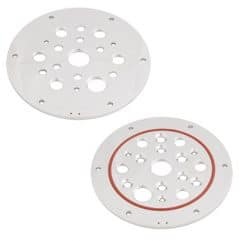 Includes Teflon spacer AS-111 Silicone O-ring and B472001-2T7-M18 Headplate fitting shown. 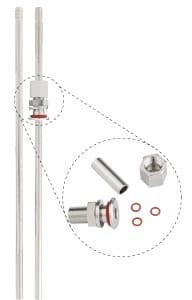 Standard 6 mm tube fittings for attaching the cold water tubing can be hooked up to either a standard bench water supply or to a recirculating chiller pump. 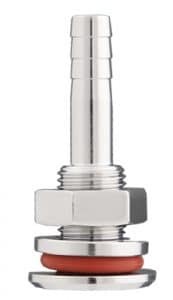 Compatible with 2 – 5 liter vessel, M18 x 1.5 port Sensor Fitting. This is used for heating the vessel contents and controlling to a set value, say 37 degrees Centigrade. Made of flexible silicone coated heating elements, it plugs into a standard 110 VAC temperature controller or BioNet vessel control system. Standard 6’ cord length (Special lengths up to 15’ available on request). Compatible with BioNet Tower Heat Blanket Outlet.